Get around with jetpacks, mechs, wings and more. 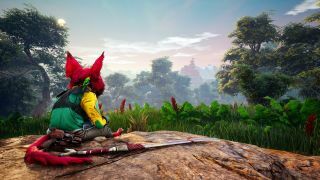 Biomutant is the open world RPG to watch this year: a mutant and mech-focused game with a gorgeous post-apocalyptic landscape to explore, and not a boring human character in sight. Instead you'll be playing as a cute, Rocket Raccoon-style mutant critter, who you'll be able to customise to your liking. You can watch the full presentation below. Biomutant is due out sometime this year, and if you want to learn a little more about this promising and refreshingly strange open world game, be sure to watch our interview with Ljungqvist from the Weekender, which also features a load more game footage.